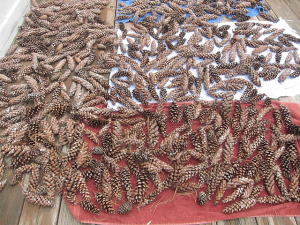 Drop the washed pine cones on a tarp, shake them a bit then place them on a towel to dry. Let the pine cones dry outside for one to two days. The pine cones close when they are wet. They are ready for wreath making when they start to open. Place a large tarp on your floor work space. 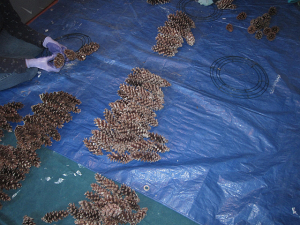 Sort the pine cones by size: small, medium and large (wear gloves and old clothes since there is still sticky sap on the pine cones). Pinch off the small stems at the base of the pine cones. 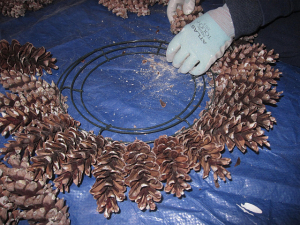 The pine cones are ready to go into your 12 or 16 inch metal wreath form. Insert the pine cones into the metal form by pinching and pushing the base of the pine cone through the outer rim of the form. Four to Five pine cones will fit in each section. Fill the outer rim completely around. You will have one circle of pine cones. Dipping the base of the pine cones in water makes them close and slide easily into the frame. 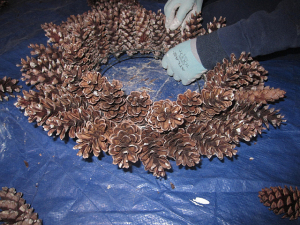 When the pine cones dry, they will open and fit in tight and more secure. There are five pine cones in this section. 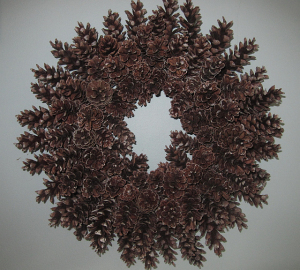 You will need 100 to 125 pine cones to make one wreath on a 12 inch frame. Insert the large pine cones in the outer sections, the medium pine cones in the middle sections and the small pine cones in the inner sections. There will be three concentric circles of pine cones. Make a hook with florist wire wrapped with floral tape. Secure the hook to the frame on the back of the wreath.The wreath looks beautiful plain or decorated with natural objects – berries, leaves, small pine cones, or evergreen pieces. 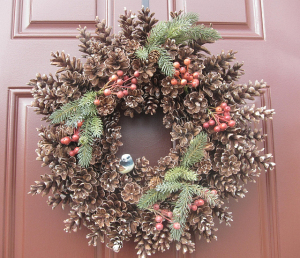 The wreath becomes fuller as the pine cones dry. Enjoy your homemade wreath. It will last a long time! where did you get your metal frame? and in these pictures is it a 12 or 16 inch frame? Great idea. Great directions. I made mine today and it looks really good. Thanks so much for sharing!! Thank you! I am glad it worked out for you! Are your pinecones still damp? 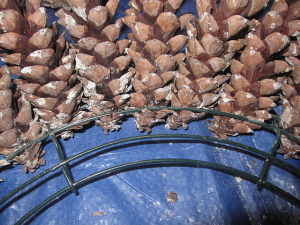 It is best to work with the pinecones when they are damp/wet and insert at an angle almost horizontal with the frame. When the pinecones dry they will open up and get more secure in the frame. Hope this helps. Thank you. It is very sturdy, too. Be sure to wear gloves when you put it together. Have fun pine cone collecting. I couldn’t get any sound with this blog. How much bleach did you soak the pine cones in and for how long? 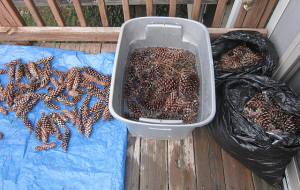 We soaked the pine cones in about 1/4 cup bleach per 5 gallons for 15 minutes. I soak the pine cones for over 10 minutes. It should kill the bugs. Never had a problem with bugs from the pine cones. This is a beautiful wreath, and the directions were easy to follow. Thanks so much for the tutorial. I made my wreath, and sprayed with Krylon clear sealant which gave it a slight sheen. I am excited to decorate it for fall, and make a couple for Christmas gifts. Again, thanks for your pics and instructions! Glad your wreath turned out in time for fall season! Thanks for tip to spray with sealant. Never tried that. I never tried painting them then soaking. But it may cause paint to get damaged. Mat be best to paint after assembly. It you soak the pinecones in a gallon of bleach for two days they will turn white. They are beautiful. Dry them out in the oven @ 225 degrees. These great for a naturally beige wreath. Thank you for the instructions. I made my wreath and it looks fabulous. Since it would be hanging in my dining room I baked the cones on 200 degrees to kill any little insects. I found that using a toe nail clipper is an easy and fast way to get the thorny tips off. Makes assembling easier. Thanks again and Happy Holidays!